← Diversity In All-New Marvel NOW! This issue begins in the wake of the ending of Star Trek: Into Darkness, with Khan being brought in before a full Federation council for a trial. He is charged with wholesale murder of Federation civilians and hence his trial is a Federation matter rather than a specific Starfleet one. After some initial hostility towards his accusers, Captain Kirk and First Officer Spock, Khan begins to narrate the tale of who he is. He tells of who he was before Admiral Marcus found his hibernation pods, and those of his fellow superhumans. Going entirely on the basis of this issue only, and ignoring any previous in-continuity material (since the new movies are creating their own continuity and this comic is a part of that), this is a fairly decent issue. I’m previously familiar with Mike Johnson through his work on the first year of Supergirl in the New 52 and its nice to see him doing something else these days. I haven’t exactly kept up with his work, so he could very well have been busy since he stepped off Supergirl, but still, his scripts were decent material. And that’s what this new comic is as well. Its a decent enough story that could be better, but it does tell an interesting tale of how Khan came to be. Or rather, how Noonien Singh became who he is, the early days of his metamorphosis into a superhuman. 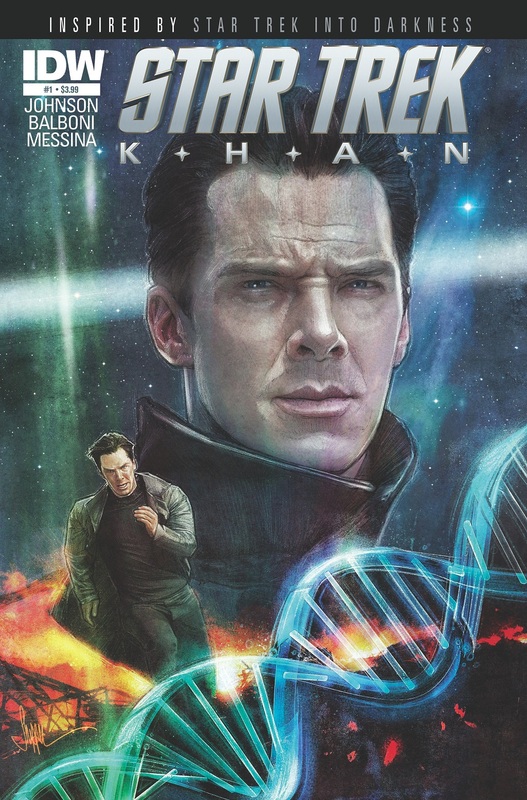 One of the things I liked about this comic is that in a very short and sweet sequence the point is made that the Benedict Cumberbatch Khan looks absolutely nothing like the Ricardo Montalban Khan. The original Khan was flawed in terms of casting because a non-Indian actor was playing a fully Indian character, and this error was magnified by the new movie which had a pretty much full-white cast. So its nice to see that some effort is being made to explain the changes, albeit lore-wise. The story itself is fairly predictable, especially if you have familiarity with the Greg Cox novels to a degree since they too focused on how Khan came to be. However, predictable in this specific case doesn’t mean boring. The story flows pretty smoothly from page to page and the enjoyment factor is from the execution rather than the beginning and the end. Knowing that Khan is a super-genius in addition to being physically superior to regular humans, it is still entertaining to see how he flips the tables on those who created him, and through the dialogue of Dr. Heisen, we get a nice glimpse into Khan’s early childhood and his development. It also establishes the groundwork for the Khan-to-be. There is an interesting division of the artwork in this issue. David Messini does the pencils and inks for the present story while Claudia Balboni does the pencils for the (main) flashback story with Marina Castelvetro doing the corresponding inks. And Claudia ScarletGothica does the colours for the issue, while Neil Uyetake does the letters. The art, throughout, is very dynamic and lively. For his part, David Messini does a pretty good job of staying true to the actors who portrayed the relevant characters in the movies. There are some slight differences in how they are drawn, so that the art is not an exact likeness but close enough. The characters are instantly recognizable and that’s the main thing. Claudia Balboni has much more freedom of course and she uses that to the utmost. The art is generally minimalist, and lacks any particular flourish, but it is good, clean artwork regardless. And as far as the colours are concerned, they were the same. The lighting effects used were a nice touch, although the issue was a bit too bright for my tastes. And given that the movie this is based on is called Into Darkness, there’s a slight disconnect. Overall though, this was a fun issue, and I’m looking forward to reading the second next month. Its going to be interesting to see how the lore is changed/rebooted/affected. Posted on October 18, 2013, in Comics Reviews, Review Central and tagged Claudia Balboni, Claudia ScarletGothica, Comics Review, David Messina, Khan, Khan Noonien Singh, Marina Castelvetro, Mike Johnson, Neil Uyetake, Review Central, Science Fiction, Space Opera, Star Trek, Star Trek: Into Darkness, Star Trek: Khan. Bookmark the permalink. 8 Comments.